Whether or not you actively sought them out, you’ve very likely come across numerous social media influencers while browsing online. The social media influencer is the YouTuber testing foundation makeup. Or the gamer streaming the latest release. Or the traveling couple posting vacation shots for millions of blog followers. Social media influencers have established credibility in a specific industry, which they use to help build relationships between brands and consumers via a blog and/or social media platforms. Using influencers as part of your digital marketing strategy can help you reach new consumers and increase brand awareness via a familiar and trusted source. The more people are talking about you online, the better the chances of your website getting discovered. Influencers can either be considered macro or micro influencers, depending on the size of their following as well as the quality of their content and the loyalty of their followers. You will need to customize your strategy when approaching these two different types, but there are some universal tactics that will help you when working with all influencers. When it comes to social media marketing, you may have a very small budget... or you may have no budget. Don’t be discouraged, because you can still have success with influencers. Some influencers charge a fee to promote products, but not all of them do. If you have a smaller budget, consider working primarily with influencers who don’t charge a fee and using the budget you do have on one or a few special influencers with a hefty reach. It’s possible that you may not have any budget – $0 a month. If so, make that clear in your initial conversation with influencers. You don’t have to be so blunt as to say, “We don’t have money to pay you,” but instead state why you want to work with them and be clear about other benefits you could offer. Other benefits can include free samples of products for them or their followers, a specific discount code they can offer to followers or promotion of their blog or site through your brand’s channels. Free product and exposure is often enough, as influencers are looking to grow their pages as well. To maximize your influencer efforts, continuously test offerings and promotions to see what works and what doesn’t. Of course any brand would love the idea of a macro-influencer promoting your product to tens or hundreds of thousands (maybe even millions) of followers. But be warned… It’s a well-known fact in the world of social media marketers that many brands and personalities buy followers on Twitter and Instagram. Purchased followers can make one account look like they have a broad reach, when in actuality there’s no substance to many of their followers’ accounts. They could even be bots rather than real people. Why would you want to work with an influencer who promotes your brand or products to a phony audience? There are ways you can tell if an account has purchased followers. Take a look at their followers vs. their average engagement per post. If they have 30k followers and an average of 35 likes on their Instagram photos, something is not right. This becomes even more clear when their photos are of poor quality (we’ll talk more about this below). If your budget doesn’t allow you to work with established macro-influencers who haven’t purchased followers, fear not. There’s still plenty of value in working with many micro-influencers whose followers ask questions, click links, share posts and ultimately care about what they have to say about products. Before you start clicking around on social media, it’s important to first determine what you’re looking for in an influencer to narrow down your search. This is especially important if your budget is tight or/and you’re specifically looking at micro-influencers. We recently created a social media influencer program for a client. Before we began our outreach, we determined the types of photos we were looking for and the overall color scheme we wanted. From there, we created a photo guide which you can see below. If nothing else, an influencer can help you build content. Before communicating with them, check out their pages and the content they’re putting out there. Are they making offensive statements? Are they posting photos with natural lighting that clearly display the products they’re working with? Are they simply posting photos and not sharing their opinions? You may also want to consider the look and feel of their page in comparison to yours. If the themes, colors and visuals don’t jive with your page, it might not be a good match. For example, if your brand utilizes a lot of bright or neon colors, it might look out of place on an influencer page that posts exclusively in black and white. Once you’ve sent someone product to review, it would be pointless not to monitor their pages to see the type of responses a post receives. 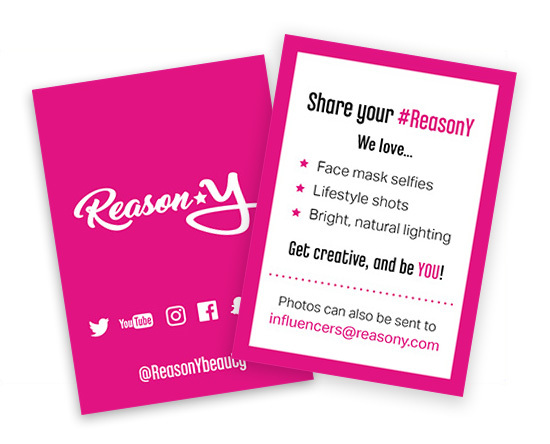 As you can see in our photo guide (which we send along with our client’s product), we made sure to include all of our social handles and our brand hashtag. We also reiterated these important aspects in our email communications, as we want to make it as easy as possible for us to engage with both the influencer and his/her followers on social media. Monitor your social pages and brand hashtag throughout the day to ensure you don’t miss anything. You can also turn on notifications for your influencers so that whenever a particular person shares a post, you will receive a notification. In addition, if you really like someone’s work, consider working with them on a regular basis. They may be the perfect candidate to build a partnership with as you expand your brand. As you reach out to influencers, remember that each one of them will have unique requests and responses to your proposal. Some will be enthusiastic to work with you while others may completely ignore you altogether. If you do your homework, find quality influencers that are relevant to your brand with loyal followers and offer them straightforward resources, you’ll likely build pathways for your quality content to go through social media influencers directly to their followers.